Looking out at slants of raining sadness. As he holds his own hand. As you may recall (it is oft said) that this is a Sufi blog. But that begs the question what is Sufism? And I speak mainly from my own experience, since my time as a Sufi mureed (initiate) was seven years (1972 to 1979) of studying the writings of Sufi Murshid Hazrat Inayat Khan, who was of the Moinuddin Chishti school. (As I was taught, there were four main schools of Sufism). This Chisti one placed an emphasis on the arts, as their path toward God. Indeed Inayat Khan was a celebrated musician. And the order I belonged to was heavily nto the arts. Each year we put on a musical play, on mystical themes. There were also many singers, dancers, artists and poets. Well, at least two I can think of. Me and Rachel Dacus–then Abrams (Well-published now–google her!). 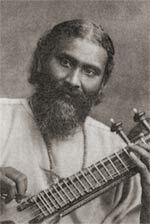 The photo above is of Inayat Khan with his instrument, which I believe is called a vina. And an objection might be raised saying, but what if God is nothing like what is imagined? Since God is infinite and we are not, our brains and intellect are not, and so perforce it comes down to imagining stuff. I fancy some will throw up their hands saying well then what chance is there we’ll have any accurate conception of God? But this presupposes this to be an important question. After all, understanding in this sense being impossible, is that ipso facto a problem? Especially since in trying to understand the infinite with our finite brains is a wild goose chase, since as the cofounder of my Sufi order, Meher Baba said, to try to understand God with your brain is like expecting to see with your ears. It’s the wrong organ. The right organ for that is the heart. I will carry this further. We can imagine God to be in a totem pole or a doll, and God will manifest in that. Just like Pinocchio turned into a real boy. Then there is the person who has imagination which is strengthened by faith. He not only prays to God, but he prays before God, in the presence of God. Once imagination has helped a man to bring the presence of God before him, God is awakened in his own heart. Then before he utters a word, it is heard by God. When he is praying in a room, he is not alone. He is there with God. Then to him God is not in the highest heaven but close to him, before him, in him. Then to him heaven is on earth and earth is heaven. No one is then so living, so intelligible as God; and all names and forms disappear before Him. Then every word of prayer he utters is a living word. It not only brings blessing to him, but to all those around him. It might take a long time, admittedly. And while Inayat Khan never explicitly talked about reincarnation,* it was obviously something he believed in, from the connotation given in his writings of the perforce gradual and drawn out nature of our spiritual development. But then there is always grace (which keeps things from being cut and dried) and so the issue is complicated. As seen in my poem above. *Sufism is originally derived from Islam, which does not talk about reincarnation. And neither does Christianity, though I have heard rumors it was in the Christian tradition until the fourth century when it was no longer talked about. And if you read much about Inayat Khan you will gather that he was big on not rocking boats, going with the flow of everyone’s belief system, saying that what mattered was the heart behind it all. Hence unlikely that he would dwell on anything controversial, except as was connoted in his writings, which as I say are rife with talk which would not be meaningful without reincarnation. And Meher Baba, who thirty years later reoriented my Sufi order, quite explicitly confirmed the reality of reincarnation.